As my five-year wedding anniversary is quickly approaching, I decided use this week’s post to feature our wedding invitation and program. I was a bit more hands-on with the wedding preparations than most guys are. Part of that is simply because I care about aesthetics. And part of it is because we had a four-month engagement. Friends had big expectations for our wedding as Kate and I are both artists. But we kept it pretty simple and traditional, adding our own artistic touches here and there. Our pastor suggested we have someone doing a painting live on stage during the ceremony, but we decided against that. Instead, the stage featured one larger piece of artwork from each of us. On one side of the stage was a flower painting Kate had recently completed, surrounded by foliage, flowers, and props. On the other side was a wood-based piece I had recently completed, displayed very simply. Our stage featured Kate’s artwork on the left and mine on the right. We picked a theme. Themes are fun and they give you concept around which to base your decor and design. Our theme was birds and it showed up a number of places, included our guest book. On Amazon we found an oversized book featuring birds and a lot of white space. Guests were invited to sign in on a page they enjoyed. Our guestbook was full of birds, plus plenty of white space for visitors to sign their names. 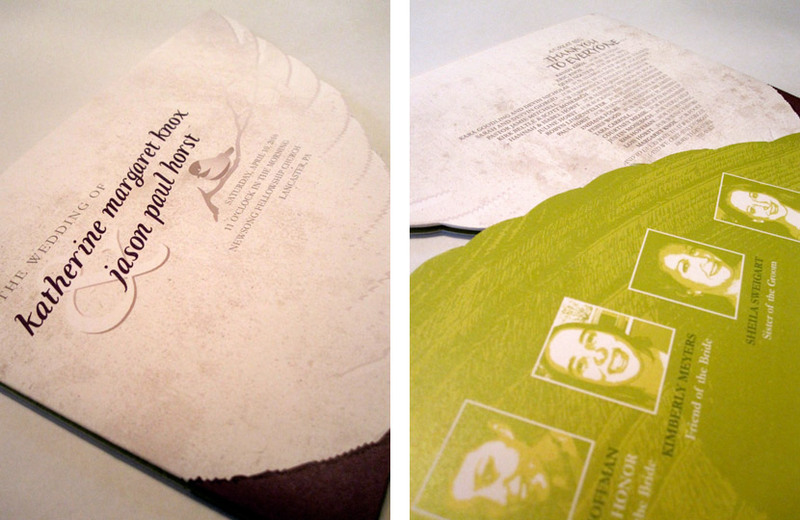 The bird theme carried over into our invitations and programs. Both used non-traditional layouts. The invitations were a blast to create. They consisted of five panes with an accordion fold, plus a perforated tab at the bottom to return with your reply. The entire back was a solid lime green. Each pane included something different—from basic information, to maps, to an engagement photo. 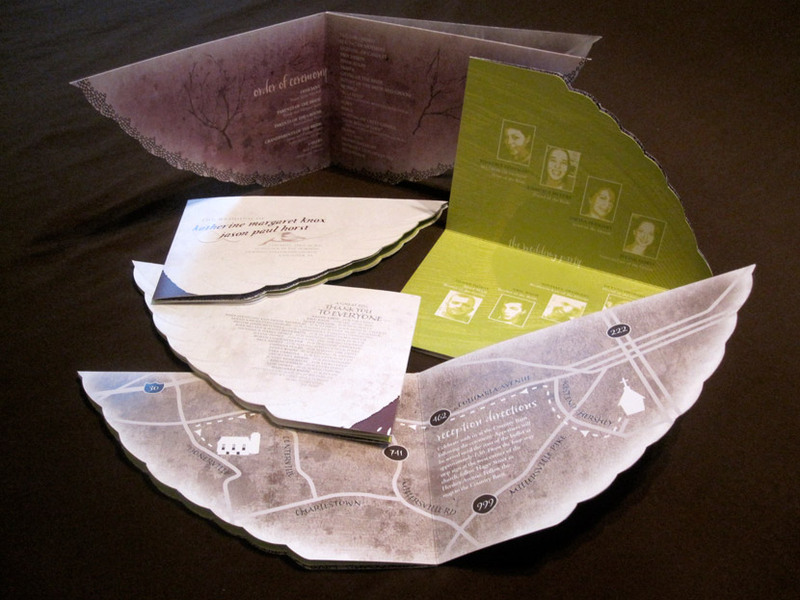 The folded piece was placed into a custom-made, semi-transparent sleeve. 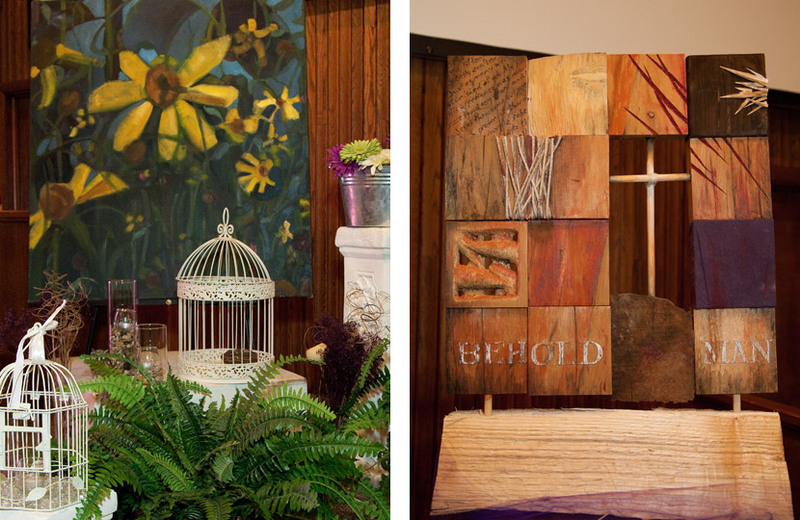 The design featured our wedding colors and was kept bright, cheerful, and fun. I would have loved to print them offset as there were many solid blocks of color (which rarely look great when printed digitally). Plus elements are just crisper when printed on offset. But we went with digital to keep the price down. 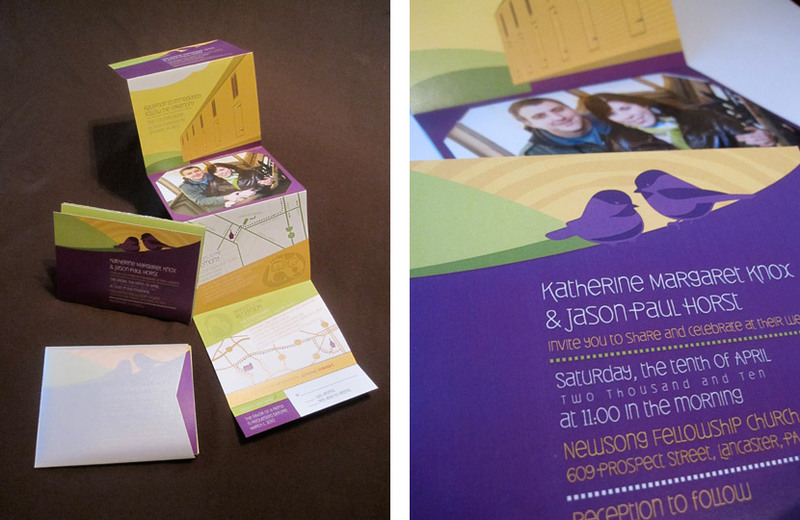 The wedding invitations featured accordion folds with five main panels. The wedding programs were even more non-traditional. Again, a bird theme was used and the entire piece took on the shape of a wing. But these were not die cut. They were trimmed by hand with a blade. This proved to be problematic as the process took longer than expected, and I got these back from the printer just a few days before the wedding. I ended up cutting most of them out well past midnight on the night before our wedding day. In fact, I had to skip one of the cuts as I ran out of time (the curve on the lower left side when looking at the cover). The wedding programs were shaped like wings and could be opened in a number of ways. But what I enjoy about this piece is that there is no correct way to open it. The sheet it was printed on was folded in half twice, and there was information on each quadrant, on both sides. So as our guests unfolded the wing, they slowly discovered different panels of information.